Amazon.com description: Product Description: Prisoners' Self-Help Litigation Manual, in its much-anticipated fourth edition, is an indispensable guide for prisoners and prisoner advocates seeking to understand the rights guaranteed to prisoners by law and how to protect those rights. Clear, comprehensive, practical advice provides prisoners with everything they need to know on conditions of confinement, civil liberties in prison, procedural due process, the legal system, how to litigate, conducting effective legal research, and writing legal documents. Written by two legal and penitentiary experts with intimate knowledge of prisoner's rights and legal aid work, authors John Boston and Daniel E. Manville strategically focus on federal constitutional law, providing prisoners and those wishing to assist them with the most important information concerning legal rights. Over the past decade, prison law and conditions have changed significantly. This new edition is updated to include the most relevant prisoners' rights topics and approaches to litigation. Updates include all aspects of prison life as well as material on legal research, legal writing, types of legal remedies, and how to effectively use those remedies. Certainly the most authoritative, well-organized and relevant prisoner's rights manual available - - the eagerly awaited fourth edition should be purchased by everyone interested in civil rights for the incarcerated. 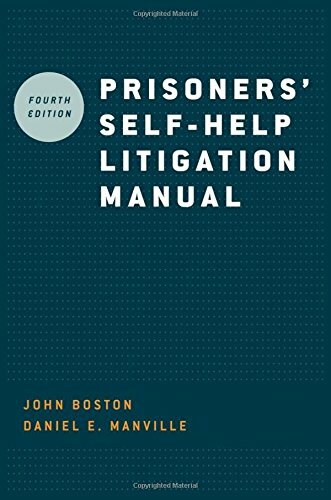 About: Prisoners' Self-Help Litigation Manual, in its much-anticipated fourth edition, is an indispensable guide for prisoners and prisoner advocates seeking to understand the rights guaranteed to prisoners by law and how to protect those rights.